Percutaneous Endoscopic Gastric (PEG) tubes are essential tools in providing enteral feeds to patients with either contraindications to oral feeds or malnutrition. Hollow viscous injuries are the most common complications arising shortly after insertion. There are very few life-threatening complications from prolonged use of the PEG tubes. We report two cases of a gastric and a duodenal perforation caused by transmural pressure necrosis from extrinsic compressions by PEG tubes. The first case describes a 55 year-old female with multiple comorbidities, including a tracheostomy and a PEG tube; diagnosed with acute pancreatitis and renal failure. Patient’s pancreatitis and renal failure were treated successfully and she was resumed enteric feeding via PEG tube. She suddenly became hypotensive and tachycardic after 48 hours of enteric feedings. She was diagnosed with pneumoperitomium by CT imaging [Image 1]. Intraoperative findings were significant for total necrosis of the greater curvature of her stomach [Image 2] where the PEG tube was inserted. Partial gasterectomy with new gastrostomy tube placement was performed. Patient’s post operative course was uneventful and she was discharge on enteric feedings to goal. The second case describes a 51 year-old male, with multiple comorbidities including a history of squamous cell carcinoma of the head and neck, post chemotherapy and radiation, tracheostomy and a PEG tube, presented with complains of a mild left lower quadrant abdominal pain while receiving enteric feeds via PEG tube. CT of abdomen and pelvic revealed a contained perforation of gastric fundus [Image 3] with the mushroom tip of PEG tube at the perforation site. An EGD examination revealed an ulcer created on first portion of the duodenum [Images 4 & 5]. A new PEG tube with inflatable balloon was inserted. Patient was treated with proton pump inhibitors and antibiotics. He was discharged after tolerating enteric feeding via the PEG tube. It is speculated that extrinsic pressure by PEG tubes on the visceral lumen will disrupt both the arterial and venous blood supply to that region leading to transmural necrosis in patients with poor nutritional reserve. 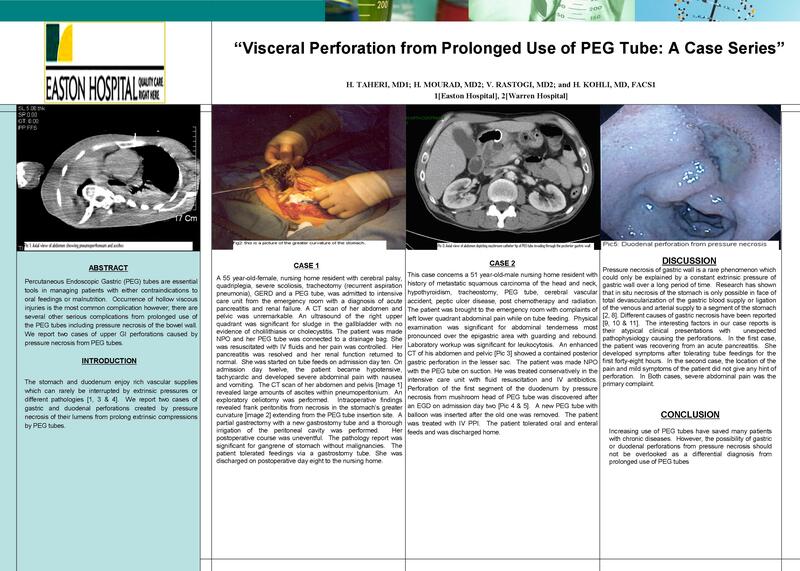 Therefore, it is imperative to consider visceral perforations in patient with poor nutritional reserve with PEG tubes.